Mark Murphy‘s The Crypt (2014) will see it’s premiere at the Fantasporto International Film Festival in Porto, Portugal on March 1, 2014. This horror film is an official selection of this film festival. 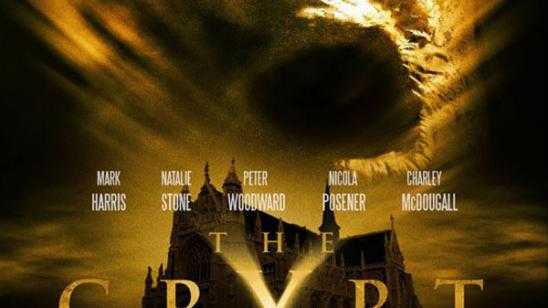 The horror movie is also being billed as a homage to The Exorcist in a new retelling of the story and will be in 3D. I am sorry but that is a lot to live up to but I am willing to give The Crypts’ demons a chance to scare me. The Crypt stars Mark Harris, Natalie Stone and Peter Woodward. Synopsis: It’s Saturday night, and two partying teens looking for a little excitement take their dates down to the crypt of a 15th century convent. With video camera in hand, the boys are out to show the girls a good time and create their own YouTube sensation. Things go wrong from the start as the teens find themselves trapped in the catacombs of the convent. The tombs have their own history, and the teens are faced with the demons that rule the underworld. The next day the teens’ dead bodies are found, and a police investigation begins. Left behind and discovered by church officials is the video recorder, which is the evidence that sets into motion a clandestine effort by the clergy to conceal what actually happened. Called into service is a special member of the church. Brought in from Rome, his job is to rid the convent of its demons by performing an exorcism. Things get even scarier when the "specialist" himself becomes possessed. The demons now appear unstoppable. Official Synopsis: The Church sends in a team to investigate the tragic deaths of a young group found in the crypt of a Convent.